Our School is fortunate enough still to have its own kitchen, preparing and serving the children with hot meals on the premises. We became a Trust in the early eighties to prevent our kitchen closing – a wise move by the Governors at the time. We remain one of the few primary schools in the county to offer our pupils school meals. The kitchen is run by Mrs Perry and Ms Perry who together produce some wonderful meals. We try, whenever possible, to use local produce and we normally provide a choice of menu; we are, also, able to cater for children with allergies and specific dietary requirements. This service satisfies both health and safety legislation and nutrition requirements as laid down by the government. The price of a lunch is £1.40 per day for KS1 children and £1.50 per day for KS2 children this can be paid weekly or we can invoice you half-termly. If you are on Income Support or any other benefit please contact the office, as your child may be entitled to Free School Meals. We also provide space for children wishing to have packed lunches. 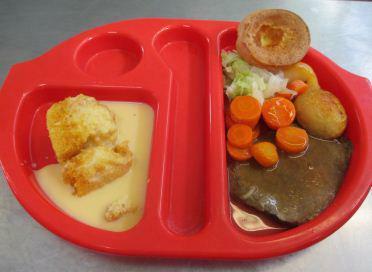 One of our delicious key stage two roast beef dinners.